We all want to be clean, don’t we? We all like to smell good, right? Well, washing with body washes packed full of chemicals can somewhat damper that fresh, healthy feeling. The healthier, more natural options aren’t all the same quality, so what’s there to do? We have all of the best organic body washes here for you to take advantage of! What are you waiting for? Now that you’ve had the chance to take a look at all of the best organic body washes, you’re probably interested in learning a bit more about each one! Keep scrolling down a bit further, where you’ll find everything you’re looking for! 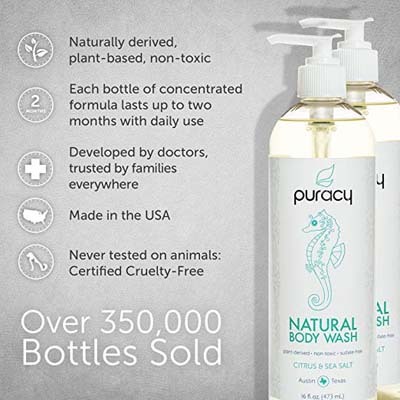 If you’re having trouble finding the perfect natural body wash with no chemicals, then you must try out the Puracy Natural Body Wash. The non-toxic body wash is SLS-free, and the Texas-based company makes sure that all of their products are all-natural and plant-based. This makes the body wash not only appealing to those who are very concerned with the products that go into/on their bodies, but also for those with skin sensitivities. So, what is it made with? Well, the doctor-formulated product is coconut based, which, as you may have guessed, is great for moisturizing and smoothening the skin. Once you put it in your hand, you’ll immediately notice that it has a rich feeling to it, and the citrus-scented shower gel provides a luxurious lather, complete with the inclusion of Pink Himalayan Salt, that works to gently exfoliate the skin, while making sure they never use environmentally unfriendly microbeads. One of the downsides in our opinion, however, was that the consistency wasn’t as thick as we pictured it being. It’s actually quite thin, and not very gel-like, which many consumers have come to expect from their body washes. The thin consistency can make it a bit messy, but it definitely wasn’t a deal-breaker for us. Overall, we loved how well it cleansed our skin and left it feeling clean while keeping it soft, smooth, and well-hydrated. The scent was definitely not overpowering and was actually a nice light, natural addition to the experience. One of the most nourishing and organic body washes out there today, easily has to be the Dr. Woods Liquid Organic Shea Butter Body Wash! First thought up by Van Woods, the son of Sylvia Woods, founder of the word-famous Sylvia’s Restaurant in New York City, not only can you rest assured that he produces high-quality products, but that they’re meant to stick around for a long time. We know how tough it can be to find good, certified organic body washes, which is why we’ve done our due diligence! The non-detergent Black Soap is naturally packed full of iron, Vitamins A and E, antioxidants, and overall work together to nourish, restore, and provide you with healthy, glowing, younger-looking skin! It works from the inside-out, so you can rest assured that these results are made to stick around. Worried it won’t work with your skin type? Worry no more! It actually works on all skin types, and thanks to the inclusion of plantain skins, the cleanser gently exfoliates the skin, improving the skin’s complexion and surface feeling/look. The organic body wash is cruelty-free and made only with sustainable, locally-sourced products whenever possible. Their vegan soaps are also free of sulfates, parabens, phthalates, and of course, detergents. Instead, they pack their product full of organic Shea Butter, direct from the Karite Shea Trees in Ghana. These fatty acids soothe and balance the skin. As you may imagine, it has a very creamy, nutty scent. It’s not too strong, and gives a nice natural scent that is reminiscent of something you’d find in the spa. Despite being so amazing for the body, it’s also an incredibly affordable product. It comes in three different sizes, but no matter what size you go for, they’re going to be (most likely) more inexpensive than any other product of the same quality. 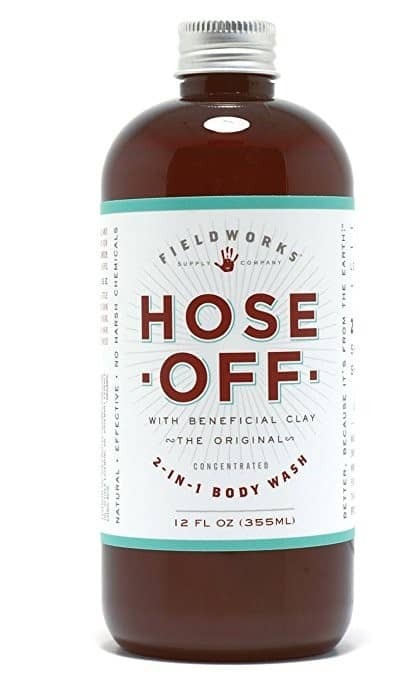 If you’re looking for healthy and organic, Portland is probably one of the first cities to look; so, it only makes sense that if you’re looking for one of the healthiest body washes, that you check out Fieldworks Hose Off, made in Portland, itself! Fieldworks Supply Company is a company which produces skincare products for both people and their furry companions. Each of their products is made in small batches, to keep them fresh and performing their best. So, what makes the body wash so effective? Probably the inclusion of clay, and volcanic ash. Volcanic ash works to draw out impurities, while clay also works to draw out impurities from the skin in a natural way. 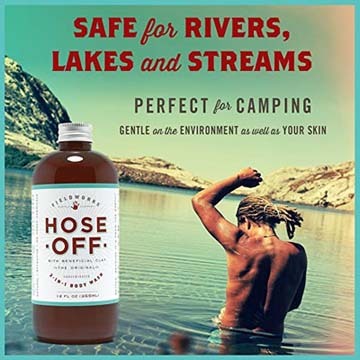 So, what else does Hose Off include? Coconut Oil, Olive Oil, and Sunflower Oil work together to cleanse the skin, while Aloe and Shea Butter hydrate and moisturize, so your skin isn’t cracked and rough. Rosemary is tossed in to improve blood flow, which can help repair dry skin, as well as transport nutrients and vitamins. 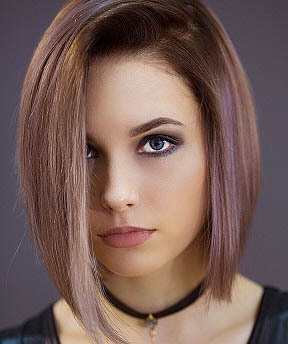 Sulfates, preservatives, and harsh chemicals. 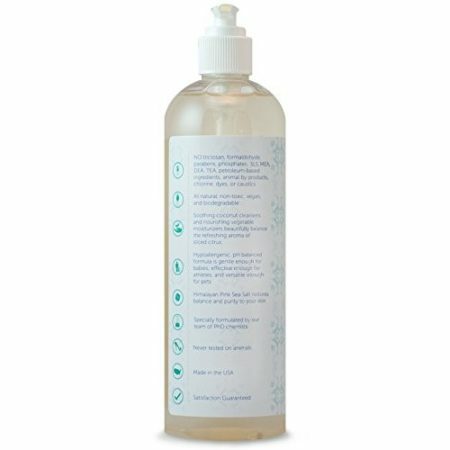 The 100% organic body wash is hypoallergenic, making it perfect for those with allergies and/or sensitive skin. Did we mention it is a 2-in-1? That’s right, not only does it work wonderfully as a body wash, but it also functions as a shampoo for your hair! If you want a gentle, effective, pleasant-smelling cleanser, then this is your go-to! If you work out a lot at gyms or spend time in communal areas such as locker rooms, then you’ll also appreciate the fact that this non-toxic soap brand even works as an antiseptic and antifungal! You may be wondering why the cruelty-free body wash is so expensive in comparison to many others. That’s understandable! However, we would like to let you know that we only needed the smallest amount of product to get a deep, thorough clean. It lasts a very long time, and if you compare the price per use, it’s actually quite affordable! Overall, the chemical-free soap and shampoo is quite impressive, and we couldn’t find many “negatives” about it! Are you one of those that no matter how hard you try, no matter how many alarms you set on your phone, that you just can’t seem to be a “morning person”? 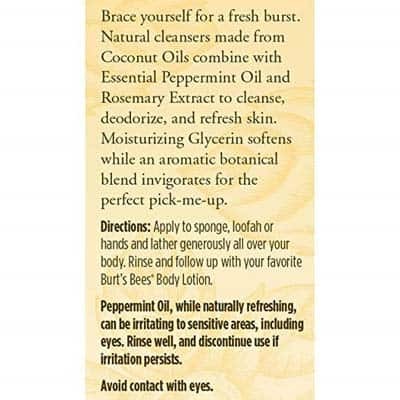 What you need is a little pick-me-up, like the Burt’s Bees Peppermint and Rosemary Body Wash. This natural body wash is uplifting and energizing, and may do the trick if your pot of coffee isn’t. The 99.2% natural body wash features Peppermint Oil and Rosemary Leaf Extract to increase circulation and leave the senses and your skin feeling awakened, and refreshed. Keep in mind, that it’s also free of parabens, phthalates, and SLS, so you don’t have to worry about any harmful ingredients. Keep in mind, that it may work for those with sensitive skin, however, it may not. Many are sensitive to Peppermint, so it’s important to remember that. Well, the packaging is trendy and looks nice in the shower. It’s also very easy to use, with its flip-top lid, rather than a twist-top that can be a bit more complicated. We also liked that the bottle was transparent, so you can see how much you have left. The product itself is very liquidy/gel-like, however it is probably the thinnest product on this list. That can make it a bit messy. It doesn’t lather like most of the others, however, this is probably due to the lack of SLS and sulfates, which are potentially harmful, anyway. In fact, it’s great at hydrating and leaving the skin feeling soft and smooth. No matter what type of skin you have, you’ll love how your skin looks and feels just after the first use of this organic body wash! We’ll start right off by saying that the main reason that attracted us to the Korres White Tea Showergel, was the fact that it’s so on-trend right now. However, it isn’t without faults. First off, the body wash is a bit on the expensive side. While you don’t necessarily need a lot for it to work effectively, the price tag is notably higher than most of the others on our list. With that being said, it also has its bonuses. 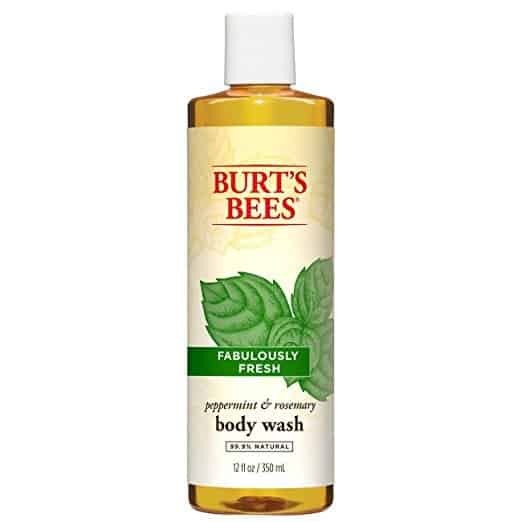 Formulated with vegetable-derived soap substitutes, it cleans thoroughly without stripping skin of its natural oils. It also has oat proteins which create a kind of barrier on the skin, fighting off free radicals and keeping skin nice and moisturized. As you’d probably imagine from the name, it smells just like white tea, which is a subtle, aromatherapeutic scent that is quite enjoyable to use. The clear gel also doesn’t foam, however, it does create a bit of a lather. It feels nice on the skin, and is as gentle as it smells, so even if you have dry and/or sensitive skin, you should be fine. It won’t be tough enough to clean off makeup or, say, body paint, but if you want a gentle daily wash for your body, then this will do the trick just fine. Overall, we enjoyed it for what it was, but compared with most of the others on our list, it wasn’t our absolute favorite. It didn’t cleanse as deeply, and while we did appreciate how gentle it was and how good it smelled, it just wasn’t as efficient. Now that you’ve had a chance to read through each of the best organic body washes, have you settled on the perfect one for you and your body-washing needs? If not, that’s okay! 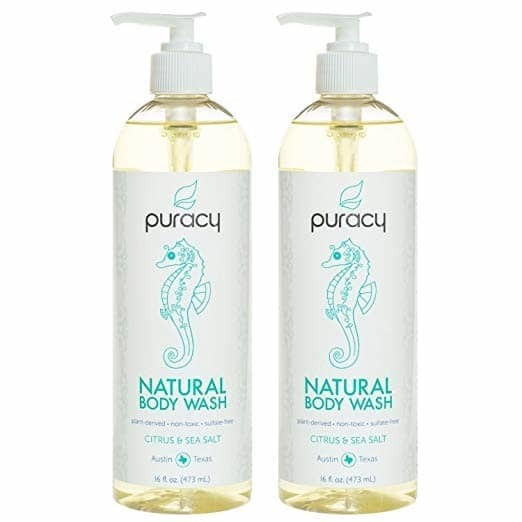 Allow us to reiterate how much we personally loved the Puracy Natural Body Wash.
First of all, it’s actually one of the most affordable products on the market, today. It lasts a long time, and you only need a small amount to wash your entire body. Not only that, but it’s so gentle that you can even use it on your children. That means you don’t have to buy various products for the entire family. Especially considering that children often have sensitivities to body washes that aren’t organic. Free of the 12 major toxins, it’s very safe and gentle to use. 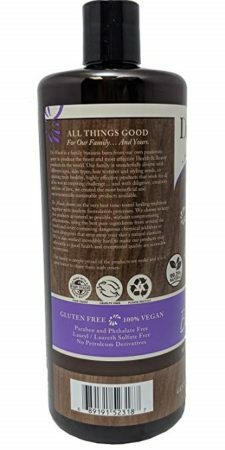 It’s even SLS-free and vegan, so vegetarians and vegans can use this product without worry. The product itself cleanses well, but also works to smooth, soften, and hydrate the skin upon the first use. It leaves the skin feeling rejuvenated, and works well with all skin types. So, which one of these best organic body washes will be making their way into your shower?